This page includes the following tools: Giving Feedback, information about the role of Change Teams and Caucuses in race equity work, race equity principles for taking action, and a race equity tool for organizations in developing explicit goals. Adapted from Arnold, Burke, James, Martin, and Thomas, Educating for a Change, 1991, Toronto: Ontario: Between the Lines, pp. 130-131. 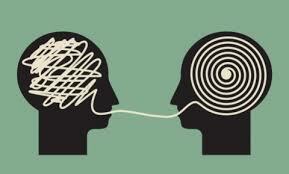 Offering feedback is one method of learning about what is working and what could be improved. Offering feedback is not about judging skills, knowledge, and understanding; neither is it about hurting feelings. Often our habit is to say what we like publicly and what we dislike privately and to someone else. This makes it very difficult to learn from our experience and mistakes. It also creates a climate of distrust. Offering feedback is a tool, which should be used strategically. Because we work in organizations that must think critically, we sometimes have difficulty discerning when critical thinking is helpful and when it becomes important to offer support, regardless of the circumstances. Approval and affirmation are as important as critical thinking; both should be offered at appropriate times. talk in the first person–“I felt...”or“When I heard you say . . . I had this reaction” show that you are speaking for yourself and avoiding general or global conclusions. be specific. – Focus on the particular action or statement. Avoid saying things like “You always . . .” or “You keep on . . .” and give a specific incident or example. challenge the idea or action, not the person – Stick to the actions or behaviors that a person can do something about. ​combine recognition of what worked with a challenge to improve – Be as specific as possible about what worked and speak to the reasons it worked. ask questions to clarify or probe the reasons – Assume that people have a reason for what they do, and ask them to explain it so you can give more credible feedback. identify the bridges – It helps to acknowledge when you act or think in a similar way, saying things such as “I know that when I am in this situation, I tend to . . .” in a way that reminds the person that you’re on the same side. You may want to bridge by acknowledging differences – “I know my experience as a man is different, but it still may be useful to note that . . .” It can help to acknowledge that you’ve gotten stuck or had a similar problem and the issue at hand is helping you to reflect on what to do as a facilitator. wherever possible, make specific suggestions for alternative approaches – Questions like “Have you considered . . .” or “What would happen if we tried . . .” open up possibilities. Using ‘we’ suggests this issue is of interest to the whole group. Encourage a range of solutions to make the point there is more than one way to do it. Maisha Z. Johnson's article on 3 Things to Consider When Choosing Between Calling Someone Out or Calling Them In. Maisha Z. Johnson's article on 6 Signs Your Call-Out Isn't Actually About Accountability. One way to facilitate a race equity process in your organization or community is through the creation of a change team and caucuses. The change team is responsible for leading the race equity change, including the formation of clear race equity goals and processes to achieve them. The caucuses are spaces for People of Color and white people (and/or other identity groups) to support the work of the change team. Note: The policy at dRworks was that people had to go through a Dismantling Racism training to be eligible to join the change team; everyone was invited to participate in the caucuses. If people came to the caucuses who had not participated in a workshop, then those leading the caucus needed to be thoughtful about how to bring those people into the discussion (keeping in mind they may not share the language, analysis, or ways of thinking of those who have been through a workshop). and understand that they can’t do it alone. They understand their job as building a group of people who will take over leadership of the process and in turn develop new leaders. evaluate and make changes in the strategy as needed. Identify your equity vision and the goals that will help you reach your vision. Who else shares this vision? Is it widely felt? The answers to these questions will give you an idea of how difficult or challenging it will be to make changes (the more people who are excited by the vision, the easier it will be to take it on). Identify who needs to be involved in setting the specific goals (see below). Involve a larger group whose participation will help them understand the process and make it less threatening. State a specific goal or goals that will move your organization toward the vision. These goals need to be tangible. In other words, ‘eliminate racism’ is not a tangible goal while ‘get the board to adopt by-laws specifying percentages based on race, gender, income, sexual identity, etc.’ is. Talk about how the goal (or goals) is (are) in line with your organization’s values and mission. Identify what’s working as well as what additional support is needed. Rather than frame your equity vision and goal as a problem to be solved, assume that people and the organization as a whole is already doing some things well in relationship to the goal. Identify what’s working and then ask people to identify where they need additional support. Remember that some people will equate this process with criticism of their work or of the organization and as a result will resist the process. Think about whether you need to engage those people or work around them. This will depend on how much power and influence they have to affect the process. Identify who in the organization shares a desire to reach these goals. How much power do they have to influence decision-makers (answer to number 2) in the organization? What is their self- interest? Identify who in the organization is threatened by or opposed to these goals. How much power do they have to influence decision-makers (answer to number 2) in the organization? What is their self-interest? Identify the specific strategy steps the change team and/or the organization will take to meet the goals. How will you involve allies and address challenges from those who are threatened or opposed? How will you include those who might otherwise oppose you? Who should be recruited onto the change team? Who will coordinate the efforts? When and how will people meet to work on these goals? Develop a timeline. Build in evaluation and reflection. At what points will you revise your strategy? How will you build change team morale and relationships? How will you make sure the work of the change team is integrated into the organization (as opposed to becoming a ‘fringe’ or ‘clique’ activity)? When did the change team last meet? Do you have plans to meet in the future? Who is leading the change team? Is there someone who takes responsibility for making sure the team is meeting and getting work done? Has this responsibility changed hands, or has one person pretty much been responsible? How is this leadership pattern good or bad for the change team? How would you describe the morale of the change team? What are some of the strengths of the change team? Where is the change team getting stuck? Is the change team meeting resistance from others in the organization or community? If so, why and what can you do about it? When you look at your reasons, are you stuck in blaming others (in other words are you requiring other people to change before anything can get done)? Or are you taking responsibility for addressing the problems that come up? Is the change team finding the kind of support it needs in the organization or community? If not, why not and what can you do about it? Are you truly encouraging new people into the organization or community? Are you making them welcome and giving them a chance to grow? Are you making time in your meetings for personal sharing and reflection? Or are your meetings all business and no fun? Are you accomplishing your goals? If so,are you taking time to pat yourselves on the back and enjoy your success? If not, are you taking time to rethink your strategies? ​Dismantling Racism: Workbook for Social Change Groups published by the Peace Development Fund. Reshmi Dutt-Ballerstadt provides a checklist here that helps you determine if you are supporting white supremacy. The ‘what about me?’ syndrome: The change agent wants to work to create change, but s/he also feels her/his own unmet needs; a desire to be at the center. The inclusion dilemma: The change agent struggles with the issue of how to include as many people as possible in the different stage of the change process. Cognitive dissonance: The change agent experiences conflict between what s/he considers ‘normal’ and new information. For example, religious beliefs that homosexuality is a sin vs. the voiced realities of the LGBTQ liberation movement. Fear: The fear of the dominant group: what will I lose? The fear of the target group: what will I lose? i.e. the fear that taking action will result in the loss of friends. Where to start: Requires careful organizational analysis of who wants to work with the change agent and who feels threatened and what power each or all of these people have in the organization to enable or stop change efforts. How far is this going to go? Feelings that some change is all right but let’s not go too far, particularly when those with power feel threatened or those who have internalized their experience are fearful of conflict that change might bring. Despair: The change agent’s own sense of discouragement and despair when it becomes clear that some or many in the organization don’t really want things to change. This can also occur if the change agent focuses only on those who are resisting while failing to notice, appreciate, and develop those who are interested and on board. This principle is grounded in the wisdom of experienced and effective community organizers. To use organizing mind means that we begin by looking around to see who is with us, who shares our desires and our vision. We then build relationships with those people. So, for example, if we find one other person to work with, then the two of us fine another 2 people, then the four of us find another 4 people and so on. Organizing mind is based on the idea of “each one reach one” (with thanks to Sharon Martinas of the Challenging White Supremacy Workshop) in ways that build relationships, community, solidarity, and movements. Using organizing mind helps us to focus on who and what is within our reach so we can build a larger group of people with whom to work and play and fight for social justice. This principle is closely tied to the work of Stephen Covey (The Seven Habits of Highly Effective People, 1992), which is its turn based on the work of Viktor Frankl (Man’s Search for Meaning, 2006). Covey speaks to the importance of focusing on our circle of concern, which helps us build our individual and collective power and effectiveness. Frankl, a Jewish psychotherapist, was imprisoned in a series of concentration camps during WWII and spent much of his time observing the behavior of his fellow prisoners and the Nazi prison guards. He noticed how some prisoners were more “free” than their guards because of how they used the space between what happened to them and how they chose to respond. Frankl then defined “freedom” as that space between what happens to us and how we choose to respond. Covey then took this idea and applied it to the circles of concern and influence. The circle of concern includes the wide range of concerns that a person or community has, including everything from a (public) health problem to the threat of war (what happens to us). The circle of influence includes those concerns that we can do something about (how we choose to respond). ​Proactively focusing on our circle of influence magnifies it; as a result our power and effectiveness build. Reactively focusing on concerns that are not within our circle of influence, on what’s not working or on what others can or should be doing, makes us much less effective. It also leads us to blame and/or wait for others to change before we act, which leads to a sense of frustration and powerlessness. The connection to organizing mind is that too often we focus on people who are too far away from us (our circle of concern) rather than on those who are closer who we haven’t yet organized to work with us (our circle of influence). We all know how easy it is to “talk the talk” – and the talk of racial justice is deeply compelling. This principle asks us to tie the talk of social justice to explicit goals so that people and communities have a clear sense of what social justice looks like up close and personal. When people in communities or institutions make a race equity commitment, they often have little to no idea of what that commitment means in terms of their role, their job, or their responsibility. 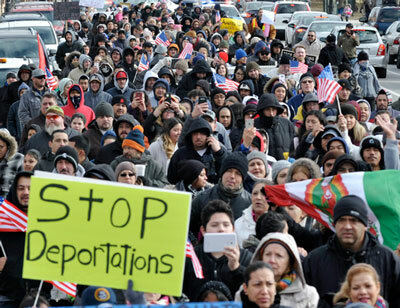 Those leading the change must build a team that can help people identify what racial justice looks like in their sphere of influence, whether it is working for a policy goal to stop deportations or an internal organizational goal to insure clear communication across language and cultural differences. We can use transparency to help people understand complexity and nuance. For example, if we are trying to land on a strategy for taking action, rather than argue that one strategy is the “best” or “right” one when there is disagreement, we can be transparent about the tensions involved in making a choice. 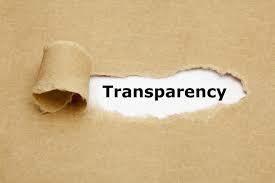 Transparency is really useful when we find we are caught between conflicting values or options; rather than force ourselves to take a position, we can make the tension transparent and work collectively to make choices about how to face the tension and learn from the choices. 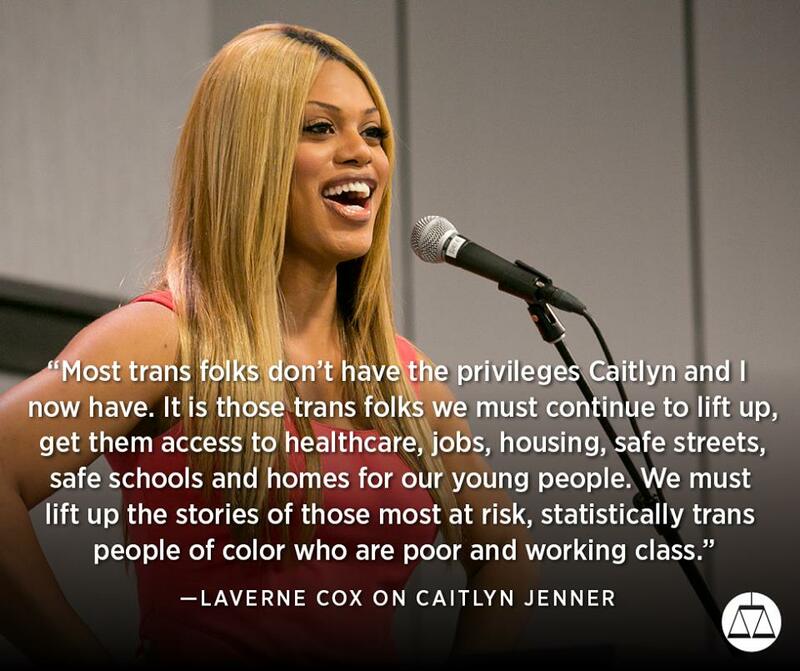 This principle comes to us from the trans community and the writing/thinking of Dean Spade. Spade, a founder of the Sylvia Rivera Law Project, talks about how equity goals are best designed when they honor and build power and agency of those most on the margins. This principle recognizes that when we frame goals and strategies in ways that benefit those on the margins, we’re framing goals and strategies that benefit all of us, directly and indirectly. One example is health benefits; when we fought (or fight) for health coverage for domestic partners, that goal and the strategy to reach it still leaves unpartnered, trans, queer, single, unemployed, and those in other than traditional relationships and a large range of poor people vulnerable. 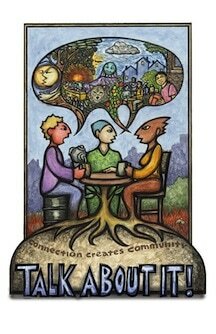 Crafting and fighting for health care that covers all of us achieves more equity and builds a larger caring community. ​Another example is how the Movement for Black Lives Platform, when enacted, will benefit all of us, including those of us who are white. A central principle of every social justice movement is the power of building relationships in the service of community. In working for racial justice, we are asked to disrupt the traditional models that assume formally educated white people are better equipped to lead and/or address problems, particularly in communities where they have few authentic relationships. Accountability is in essence a form of solidarity, one that acknowledges the deep conditioning of all of us into a racist construct that places white at the top while systematically devaluing People and Communities of Color. In this culture, we are taught to hoard power, win at all costs, see “other” as threat, and live in increased anxiety about losing our share of the so-called pie. As a result, we are separated not just from each other but from ourselves. Accountability becomes a way to reconnect through the power of authentic relationship across these false yet powerful divides. Accountability is also a form of discernment around how to live into shared values or principles. Principles help us focus beyond our own socialized confusions. Social justice values or principles are collectively created, grounded in the generational wisdom of elders, what we have learned from history, our experience, our understanding of the Creator and/or environment, and our desires for liberation. Another way of saying this is that if we are just accountable to people, we can get in trouble if the people we’re accountable to are acting out of confusion; this is where our principles help keep us grounded. If we are accountable only to principles, we tend to lose sight of the people that we are in relationship with, so our relationships can help us understand the nuance and complexity of honoring our principles. Click on this file (below) to download an article by Vivette Jeffries-Logan, Michelle Johnson, and Tema Okun about accountability from their perspective as dRworks trainers and practitioners. focused on teachers in a mid-size southern city is offering yoga classes for their members, led by yoga teachers committed to tying their practice to the vision of building a strong public education for all. We live in a culture enraptured by the idea of the single hero riding in on a white horse (or a inter-galactic spaceship) to save the day. We are all of us raised by institutions (schools, the media, religious institutions) that reinforce the idea of individual achievement and heroism. The reality is that our history and particularly the history of the arc of social justice is a history of movements. This principle is based on the idea that we save and are saved by each other. By design, the dominant culture insures that we have a very weak collective impulse; the collective impulse that people and communities held originally (Indigenous nations and cultures) or brought with them from other countries and cultures has been systematically erased in the service of racism. This means that we have to teach each other and ourselves to collaborate and act collectively. We can look for guidance to those people and communities whose resilience has preserved that impulse. Acting collaboratively and collectively means that we build strong and authentic relationships that enable us to act in concert with each other from a place of wisdom collaboratively and collectively gathered. It also means that we learn from our mistakes rather than pretend we never make them. Taking action for racial justice requires a level of self-awareness that allows us to be clear about what we are called to do, what we know how to do, and where we need to develop. Another way of thinking about this is to know our strengths, our weaknesses, our opportunities for growth, and our challenges. Knowing ourselves means that we can show up more appropriately and effectively in whatever the work is, avoid taking on tasks we are not equipped to do well, ask for help when needed, and admit when we don’t know what we’re doing or claim our skills gracefully when we do. White supremacy and racism affects all of us; we internalize cultural messages about our worth or lack of worth and often act on those without realizing it. We also tend to reproduce dominant culture habits of leadership and power hoarding, individualism, and either/or thinking. We may be dealing with severe trauma related to oppression. We may be addicted to a culture of critique, where all we know to do is point out what is not working or how others need to change. Doing our personal work so that we can show up for racial justice is, ironically, a collective practice. We need to support each other as we work to build on our amazing strengths – our power, our commitment, our kindness, our empathy, our bravery, our keen intelligence, our sense of humor, our ability to connect the dots, our creativity, our critical thinking, our ability to take risks and make mistakes. We also need to support each other as we work to address the effects of trauma and the dis-ease associated with white supremacy and racism. We do this by calling each other in rather than out. We do this by holding a number of contradicitons, including that we are both very different as a result of our life experience and we are also interdependent as a growing community seeking and working for justice. We do this by taking responsibility for ourselves and how we show up to facilitate movement building. doing the work of the organization. Similarly, we also know individuals who spend so much time engaged in personal reflection that they become lost to the movement and we know organizations who focus on personal work without tying that work to movement building. ​An example of work on all three levels is an emerging national network of racial justice activism. The network is grounding leadership in a practice called somatics, which is designed to support transformational change rooted in the belief that we benefit from understanding how trauma impacts us. The work of understanding our own personal relationship to trauma is done as a collective practice in the service of developing our individual and collective capacity to facilitate the day-to-day work of movement building. What is the desired community (programmatic or organizational) outcome? Be as specific as possible (making the goal measurable at all levels of the community or organization will help you be specific). How do these outcomes produce equity or racial justice? How do you know? How do you involve community members and key stakeholders (those most affected; those living at the margins) in informing or making the goal/decision (i.e. how do you build accountability)? What information do they have? What information do they need? What does the data, including conversations with members and stakeholders, tell about the root cause(s) of inequity related to this goal or decision? How will you proceed (circle of influence; organizing mind)? What strategies will you use and why (what are underlying values driving your strategies)? How does your approach build/serve/empower the margins? What are unspoken assumptions that need to be surfaced? What other organizations or institutions can be engaged (in the interests of accountability)? How will the approach increase and/or decrease racial justice? Be as specific as possible. What are potential unintended consequences/outcomes? How will you address these unintended consequences/outcomes? Evaluate. Reflect. Raise racial awareness. How will you evaluate your decision? Who will you involve in the evaluation? What is the role of stakeholders in evaluating and reflecting? How will you raise racial awareness with this goal or decision? The Showing Up For Justice Political Education website offers resources for white people on Taking Action and another on How to Show Up. ​Dr. 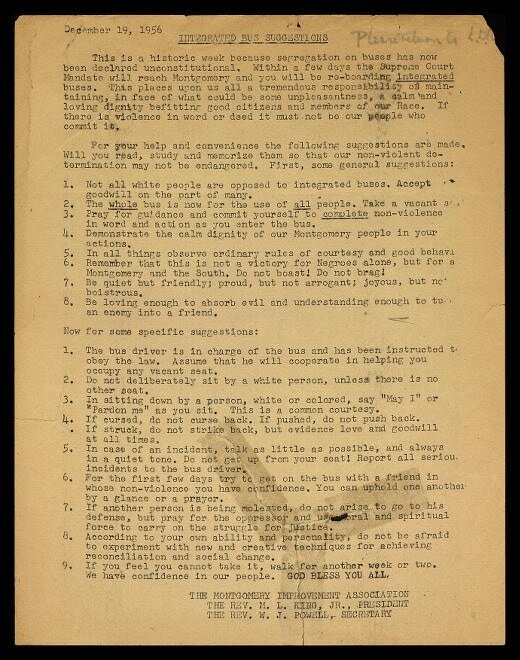 Martin Luther King, Jr.'s list of 16 suggestions for African-Americans riding newly integrated buses (1956).